Hate the long lines at the airport? Are you the kind of traveler who's always on the go? Good news! 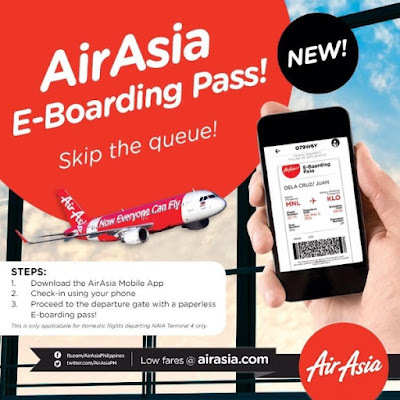 You may now enjoy the comfort of checking-in and boarding flights using your smartphones with AirAsia’s e-boarding pass now available on all domestic flights in the Philippines. AirAsia’s “E-Boarding Pass” is a paperless boarding pass that allows guests without check-in-baggage to proceed straight to the boarding gate without having to queue at the check-in counter or desk at the airport. Guests with check-in-baggage, however, are required to proceed to bag drop counter first before going to the boarding gate. At the boarding gate, AirAsia’s guest service personnel will verify guests' identity and scan their e-boarding pass. Guests may then proceed to the aircraft. Guests are required to present their e-boarding pass to the cabin crew before boarding the aircraft. Check outout AirAsia’s new products and exciting promotional fares at Facebook (facebook.com/AirAsiaPhilippines) and Twitter(twitter.com/AirAsiaPh).